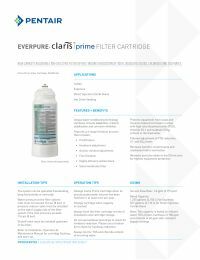 The Everpure Claris Prime EV433986 Filter Cartridge features a unique water conditioning technology that combines mineral adaptation, mineral stabilization, and corrosion inhibition. This cartridge protects equipment from scale and mineral-induced corrosion in areas with high total dissolved solids (TDS), chloride and sulphate content in the feed water. There are many applications for this filter such as coffee makers, espresso machines, hot beverage vending applications, and direct injection combi-ovens. The EV433986 can eliminate up to 5 micron sized particles, while removing harmful contaminants and unpleasant taste and odor. Claris water filter cartridge is a new technology tailored to the hot beverage market. 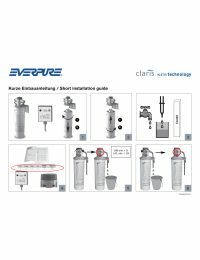 The Claris EV433986 meets all of your filtration and softening needs in one filter.